I shot this scene in mid March this year. No signs of the trees coming into leaf then, and deciduous trees in winter are one of my favourite sights to see and shoot. 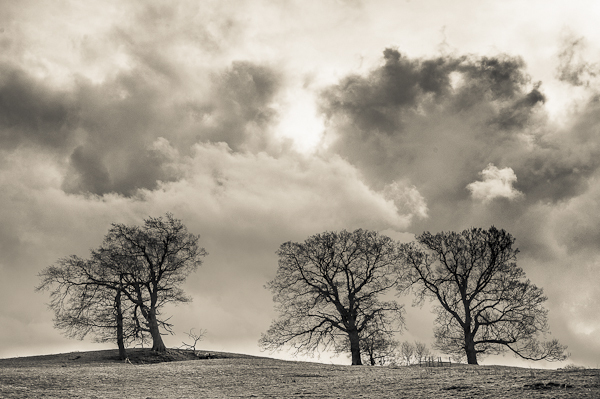 Another of my favourite subjects is the sky, I like watching clouds, no I’m not losing my grip 🙂 its just that there are some dramatic scenes rolling by and changing by the minute and I like to capture some of that. So this little scene contains two of my favourite subjects in one picture. A few weeks later and these trees will be wearing their spring and summer foliage and there will be a very different feel to the scene. Maybe I will try to get back to the same spot during the summer to re-make the picture. Nice contrast and lines!! Did you use an orange filter? Very well done! Thanks for your comment Vicky. I didn’t use an orange filter, I processed the original in Lightroom 4 which has excellent tools fir bringing out the details in an image. I share your enjoyment of this type of view. Bare trees always make interesting silhouettes. A great sky too, like this, helps. I like the subtle toning too (unless it’s my aging Laptop screen slightly off neutral). Thanks Andy, its not your laptop screen, If memory serves (and it usually doesn’t) I used a cream tone finish to this.